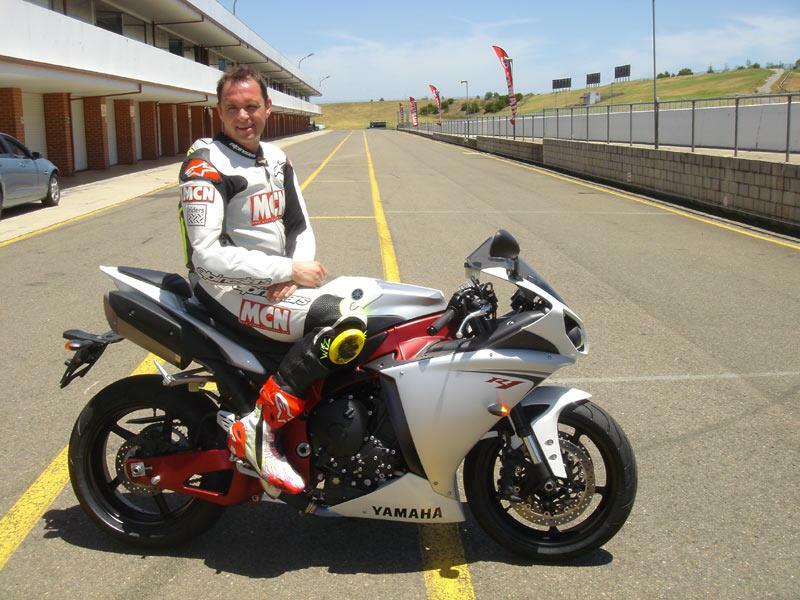 "The R1 accelerates like it has a racing engine; it has V-twin levels of torque down low and screaming four-cylinder power up top"
Senior Road Tester, Michael Neeves is at Eastern Creek in Sydney to ride the much anticipated Rossi-inspired 2009 Yamaha R1. Don’t get too caught up on how the new R1 works, with its crossplane crank and irregular firing order, which is the same as Rossi’s factory YZR-M1 (it’s not a ‘big bang’ motor - we’ll explain all in this week’s MCN for the techies among you), all you need to know is the new engine has transformed the R1 into one of the best sportsbikes I’ve ever ridden. And that’s praise indeed when you consider just how good the current Honda Fireblade is. Sitting on the new R1 for the first time, the rear is higher and the front lower than the ’08 bike and the riding position is more compact, a good sign that the R1 means business around the track. Revving the engine for the first time, it’s hard to comprehend just how quickly the rev needle dances around the dial; it spins more like a two-stroke 500cc GP machine than a litre-sized road bike. Out on the technical left-handed circuit of Eastern Creek, the way the R1 leaps out of corners is incredible. As soon as you’re ready to accelerate the Yamaha surges forward like it’s powered by an industrial-strength electric motor, it’s just seamless, instant torque and power and impossibly easy to control. During our initial sessions the R1 was equipped with road rubber and it was very easy to overcome rear grip, but such is the confidence and feel you have with the engine, slides are easy to catch and control. With the stickier tyres fitted later on I was treated to the full R1 experience and I’m left gob-smacked. Honestly the R1 accelerates like it has a racing engine; it has V-twin levels of torque down low and screaming four-cylinder power up top. The howl from the engine at full throttle is exactly the same as Rossi’s M1; it’s like your very own MotoGP bike for the road. I can’t wait to hear it with race pipes fitted. A new chassis helps the R1 to feel much lighter than the old one and steers much quicker and more accurately and as always for Yamaha, the handling is nice and neutral, although probably not as ‘pointy’ or fast steering as the Fireblade. Yamaha have managed to give us the best of both worlds with the R1. Its new, ultra-short stroke engine revs incredibly quickly for maximum acceleration and the crossplane crank and irregular firing order give it heaps of bottom end power for maximum drive as soon as you feed on the power. It’s unbelievably good around the track, is still exciting to ride and it should be even better on the road. I was shaking after my first ride on the new R1, it’s so different, so exciting and so damn good. In a stroke it makes every other sports bike out there seem a bit old and wheezy. Impressed isn’t the word.